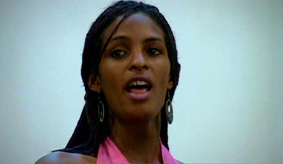 The recent documentary “Prostitución infantil en Cuba” uses scenes and fragments from the award-winning documentary “Dos Patrias, Cuba y la noche” (Two Homelands, Cuba and the night, Germany 2007) without permission. This constitutes a grave infringement of the copyrights held by the German director and producer of “Dos Patrias…”, Christian Liffers. “Prostitución infantil en Cuba”, produced by Producciones Mandarina S.L., was broadcast on the Spanish commercial television station Telecinco on Friday night 3 October 12.15 am and has subsequently received attention in various media outlets. Christian Liffers has stopped the streaming of “Prostitución infantil en Cuba” on various internet video portals by submitting a copyright infringement notification. 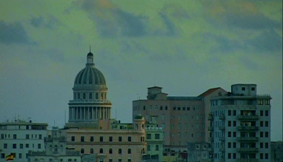 “Dos Patrias, Cuba y la noche” and the individuals who appear in the film have no relation with the documentary “Prostitución infantil en Cuba”. 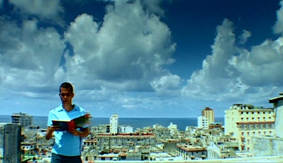 “Dos Patrias, Cuba y la noche” saw its world premiere at the Miami International Film Festival in March 2007 and has since been shown at over 60 festivals in 35 countries. In Spain, “Dos Patrias” is exceptionally broadcast on the documentary pay-tv channel Odisea since January 2008. I would be grateful if you could consider this information in your coverage of the documentary broadcast by Telecinco. 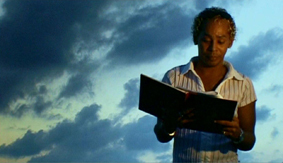 In 2004 the author made two journeys of investigation to Havana, where he won the confidence of the protagonists, so that for the first time people spoke openly in front of a camera about their homosexuality and life in Cuba. Is a former friend and colleague of Reinaldo Arenas in the National Library. He still works there to date. His life story reminds us of the revolutionary years as well as of the persecution of homosexuals in the 1970’s and 1980’s. Central issues are the revolution and religion. He is a follower of the Santería, an Afro-Cuban religion which is related to voodoo. In the Santería homosexuals are not marginalised or discriminated against. Gays are part of the traditional Nigerian myths, amongst others as rescuers of the goddess of the sea, Yemayá. He lives together with his mother in a small house in San Antonio de los Baños, a little village near Havana. As well as Tomás, he is a follower of the Santería-religion. And just like him he believes in the revolution. In the country there exist clandestine and prohibited meeting points within the gay-scene, too, to which the camera accompanies him. He is one of the most famous drag queens in Havana. Every night he performs in an illegal nightclub. He is HIV-positive and has experienced the development of the way that the Cuban authorities deal with Aids: ranging from internment in detention camps to a more open way and the possibility of free medical treatment nowadays. Photographer and artist, who has had his collages presented at several exhibitions in Havana. 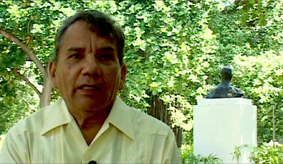 In his work he has been dealing for several years with the image of men in Cuban society and with the Cuban “Machismo”. As Tomás, he belongs to the intellectual upper-class of Havana. Just like him, he doesn’t consider the the aim of a gay movement to be an assimilation to the mainstream after the Western archetype. He rather expects the vacuum of communistic Cuba to be a chance to expose the construction of masculinity, gender and homosexuality and to create a new kind movement by being different. Son of a functionary of the Communist Party. Unemployed. He lives illegally in a small room in Havana Centro. A typical figure of the night on the Malecón: flashy and colourful. He has constant problems with the police and the authorities. Even though he is gay he does not believe in love between males, just like many other Cuban gays. Malecón, the water front of Havana, where he meets his friends every night. He suffers most from prejudice and discrimination. Even within his family he gets mocked more than loved. His big hope is being able to live as a woman one day.